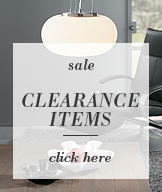 Browse our full range of clearance ceiling lights. From semi flush ceiling lights and standard ceiling lights. Here you can browse our full range of clearance ceiling lights in one place. From chandeliers and pendant lights to flush ceiling lights, we have everything you need to light up your living space. Ceiling lights are an essential source of ambient lighting in every room. They provide a wide spread of illumination. From the bedroom to the living room, a well placed ceiling light or two is the perfect way to illuminate a living space.